1950s – Crowd gathers. Mark wins. Johnny and Mark shake hands and end up best friends. 2014 – Police called, and they arrest Johnny and Mark & charge them with assault. Both expelled even though Johnny started it. Both children go to anger management programmes for 3 months. School governors hold meeting to implement bullying prevention programmes. Robbie won’t be still in class, disrupts other students. 1950s – Robbie sent to the office and given six of the best by the Principal. Returns to class, sits still and does not disrupt class again. 2014 – Robbie given huge doses of Ritalin. Becomes a zombie. Tested for ADHD – result deemed to be positive. Robbie’s parents get fortnightly disability payments and school gets extra funding from government because Robbie has a disability. Billy breaks a window in his neighbour’s car and his Dad gives him a whipping with his belt. 1950s – Billy is more careful next time, grows up normally, goes to college, and becomes a successful businessman. 2014 – Billy’s dad is arrested for child abuse. Billy removed to foster care; joins a gang; ends up in jail. 1950s – Mark gets glass of water from Principal to take aspirin with, Passes exams & becomes a solicitor. 2014 – Police called, car searched for drugs and weapons. Mark expelled from school for drug taking. Ends up as a drop out. Johnny takes apart leftover fireworks from Guy Fawkes night, puts them in a paint tin & blows up a wasp’s nest. 2014- Police & Anti-Terrorism Squad called. Johnny charged with domestic terrorism, investigate parents, siblings removed from home, computers confiscated. Johnny’s Dad goes on a terror watch list and is never allowed to fly in an aeroplane again. Johnny falls over while playing football during morning break and scrapes his knee. He is found crying by his teacher, Mary. She hugs him to comfort him. 1950s – In a short time, Johnny feels better and goes on playing football. No damage done. 2014 – Mary is accused of being a sexual predator with a minor and loses her job. She faces 3 years in prison. Johnny undergoes 5 years of therapy and ends up gay. The man thought about it and decided he would just have her shipped home for $5000. After 47 years of living in New Zealand, a Whangarei man only recently learned he is not a citizen when his employer terminated his contract due to his “immigration status”. Graeme Watson – who went to school here, got married, obtained driving and gun licences, became a registered counsellor and worked in Government-provided health services – said he might joke about being a “nobody”, a stateless person in his own country, but “it’s a bloody nightmare”. He arrived on a Scottish parent’s passport in the late 1960s and, as he had never left New Zealand, never applied for a passport. Two months ago Mr Watson lost his job because of his “immigration status” , after being employed with a private mental health provider for only five weeks. He was paid for only two of those weeks; the nationwide company telling him his outstanding wages were frozen because he may have worked “illegally”, he said. Before then he had worked for more than four years with Northland District Health Board. He was able to get Work and Income support after losing his new job nearly two months ago but is experiencing hardship and is trying to access his Kiwisaver funds. To do that, Inland Revenue requires proof of his work status. 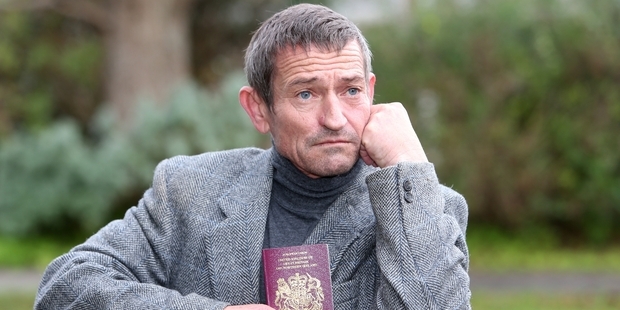 Mr Watson’s unexpected Catch 22 struggle to gain citizenship recognition saw him last week receive a brand new, but blank, British passport, with no entry visa to New Zealand included. The act gives pre-April 1972 British immigrants automatic entitlement to work and become citizens. Mr Watson said he has been wrongly put in the “post-April 1972 basket and nobody is taking responsibility for sorting this out”. Whangarei MP Shane Reti advised him to go to Immigration Services in Auckland with documentation proving how long he has lived in the country. “At the least, I might get a sticker in the back of my new blank British passport saying I can work in New Zealand, but I simply can’t afford to make that trip,” Mr Watson said. Mr Reti told the Northern Advocate he could not comment on a matter raised with him by a constituent, for privacy reasons. Immigration New Zealand area manager Michael Carley confirmed that United Kingdom citizens who took up permanent residence in New Zealand before April 2, 1974, are deemed to be residents. “There have been no recent changes that would have affected any individual’s employment or citizenship status,” Mr Carley said. “However, employers can now access Immigration New Zealand’s (INZ) online tool VisaView to check whether a person is lawfully able to work for them. Documents proving continued residence since April 1974 include rates bills, driver’s licence, power bills, tax returns, school records and employment references. Mr Watson said if this has happened to him, many others must also be stateless. Amnesty International told him the status of people whose families migrated before children were required to have their own passports had always been “a grey area”. Liberal American Professor Margo Kaplan needs her head read – she allegedly claims pedophilia is not a crime. What? Paving the way for Sharia law? Where and for whom? Islamic Sharia Law contains Satanic practises. Margo Kaplan is a special kind of liberal thinker. The special kind that believes all behavior is excusable, because we should all be ‘tolerant’. Well, I have news for you, lady. This isn’t gonna fly with most of mainstream Americans, and probably not many of your colleagues, either. The origins of the Papacy can be traced to St. Peter, one of the [supposed] original disciples of Jesus. The current pope, Francis I, is the 265th successor of St. Peter. Needless to say, all 266 popes are male. Yet, during the middle ages, there existed a story about a pope who was actually a female in disguise. The name of this supposed female pope was Joan. Who was this mysterious Pope Joan, and did she really exist? The first written account of Pope Joan can be traced to a 13th century work known as theChronica universalis Mettensis (Chronicle of Metz). According to its author, the Dominican chronicler, Jean de Mailly, there was an unnamed pope who was not recorded in the list of Bishops of Rome because she was a woman disguised as a man. The chronicler goes on to say that it was this woman’s character and talents that enabled her to occupy the seat of St. Peter. In addition, de Mailly records that the grave of this unnamed pope was marked with a Latin phrase, “Petre, Pater Patrum, Papisse Prodito Partum”, meaning “O Peter, Father of Fathers, betray the childbearing of the woman pope”. It may be pointed out, however, that de Mailly begins this narrative with the Latin infinitive “Require”, meaning “to be verified / inquired into”, indicating that even the author himself is unsure as to the truth of the story. The story of the female pope in disguise is then picked up by an anonymous Franciscan friar of Erfurt in his Chronica minor, and by the Dominican inquisitor and preacher, Etienne de Bourbon. Whilst the story of the female pope in the Chronica minor is similar to that of de Mailly’s, Etienne de Bourbon’s version includes details regarding her death. The author records that the pope gave birth in public, thus revealing her true gender, and she was subsequently dragged behind a horse for half a league and then stoned to death for her deceit. The most well-known and influential version of the female pope story, however, comes from theChronicon pontificum et imperatorum (Chronicle of Popes and Emperors), written by another Dominican, Martinus Polonus. Due to the prestige and credibility derived from his ties with the Roman hierarchy, Martinus’ work circulated widely, and overshadowed the accounts of earlier writers on the same subject. Unlike other earlier accounts, Martinus provides a vivid account of the female pope’s life. As a matter of fact, it is here that the name Joan first appears in writing. In addition to naming this pope, Martinus also provides details such as her nationality (English), place of birth (Mainz), as well as her pontificate (after Leo IV’s death in A.D. 855), and the length of her reign (two years, seven months and four days). Although Martinus reveals little about his sources, there is a tone of uncertainty in his writing, revealing that like his predecessors, he is also unclear about the verity of this tale. On top of that, some have claimed that this story was added to the chronicle after Martinus’ death, indicating that the chronicler had nothing to do with this tale. From Martinus onwards, the story of Pope Joan became more and more elaborate. One version of the story, for instance, claims that the pope did not die immediately after giving birth. Instead, she was deposed after her confinement, and did penance for many years. After her death, she was buried in Ostia, where her son held the office of bishop. As the primary written sources themselves indicate a certain amount of doubt regarding the story of Pope Joan, it is possible that the story is but an urban legend. Yet, others believe that there are ‘hints’ of this female pope’s existence in art and architecture. For instance, on the pillars of Bernini’s Baldalchin in St. Peter’s Basilica in the Vatican City, seven sculptures showing a woman’s facial expression whilst going into labour can be found. The eighth sculpture is that of a child. Some have interpreted this as that Pope Joan giving birth. Yet, there are numerous other possible interpretations of this scene that are conveniently ignored. The most popular one, for instance, is that the woman is the niece of Pope Urban VIII, who went into labour whilst Bernini was working on the Baldalchin. The legend of Pope Joan has survived over the centuries. The alleged female pope has been depicted in art, literature and plays. This tale has also been made into films, the most recent one being in 2009. Although the available evidence seems to cast some doubts regarding the existence of Pope Joan, it is likely that some would continue to believe that this figure was real. Whether as a piece of fiction or history, the tale of Pope Joan will most likely live on for a long time to come.